The theme of Synchronized Swimming, Sunday's episode of Bob's Burgers (airdate: 3/25/12), is how mother Linda coddles her children. As one example, she supposedly makes a "Navajo warrior mask." As she puts it:Gene, here's your Navajo warrior mask for your history class. I've been wearing it all morning. I love it. I'm pretty sure the Navajo don't wear masks. Oops. 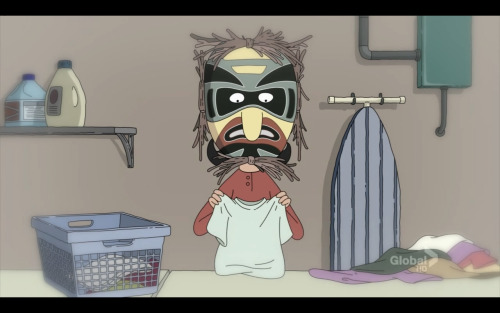 The mask's style is vaguely like that of Pacific Northwest Indians, who do wear masks in the ceremonies. This furthers the perception that all Indians are the same. Without any explanation or context, the mask looks scary. It suggests Indians are savage and barbaric. If it were a genuine mask, or even a facsimile of one, I doubt women or non-Indians would be allowed to wear it. And certainly not for "fun" around the house. This furthers the perception that sacred Indian practices are like Halloween parties--a matter of dressing, dancing, and whooping however you please. It mocks and trivializes the serious nature of Native religions. Give Bob's Burgers one point for trying to include Native lore at all, but take away the point for botching it. I'd say no school, whether real or fictional, should ask students to make sacred objects from Indian cultures. It fosters the illusion that these cultures are superficial and easily knowable. For similar examples of people dressing as Indians, see Umatilla Model Portrays Pocahontas and Stereotypical Yulefest Postcard. Yes, it would be much better for the school to pretend Indians don't exist than to assign something that might make them learn less than an encyclopedic knowledge about Indians. Fortunately, there's a third choice: teach about Indians and do it correctly.